Cell cultures have been widely used to express heterogonous genes and produce therapeutic proteins. CHO, HK273, NSO, and Sf9 are some of the most popular cell lines used in cell culture. Glucose is the major carbon source in the cultures. Therefore, the monitoring and control of glucose in cultures has been one of the most essential elements of the production process. As a result, many methods and devices have been developed for this purpose. Unfortunately, there is still no practical, in situ biosensor available to date, as all available commercial products are off-line devices. Glucose and reducing sugar were traditionally measured by wet chemistry methods that were subsequently replaced by enzymatic reaction methods. All glucose-measurement devices available on market today are based on the oxidation of glucose by glucose oxidase enzyme. A blood glucose self-monitoring device is an inexpensive and rapid detection method for measurement of glucose concentration in blood for diabetes patients. Many scientists who do not have the expensive devices have attempted to use this device for monitoring glucose concentration in cell cultures. However, because the blood contains a wide array of molecules, of which some interfere with the glucose enzyme coupled with redox reactions, blood glucose self-monitoring devices need to be calibrated and formulated with those factors under consideration. As a result, the error in measurement of glucose in culture medium that contains totally different substances becomes somewhat too large to be acceptable. In 1997, Nayak and Herman investigated several commercial devices for measurement of glucose consumption by hybridoma cells growing in hollow, fiber cartridge bioreactors. They recalibrated the devices with glucose standards in medium and buffer solution and reformulated the calibration equation. As a result, they were able to accurately measure the glucose concentration in different culture media with less than 3.5&#37 error. Cesco Bioengineering (www.cescobio.com.tw) further extended their work to make it easier, more accurate, and practical for commercial use. A series of samples with different glucose concentrations were prepared by dissolving glucose (Sigma-Aldrich, cell culture grade) in PBS and various commercial basal culture media, including aMEM, M199, DMEM, DMEM/F12, and RPMI 1640 with or without FBS (5&#821120&#37). 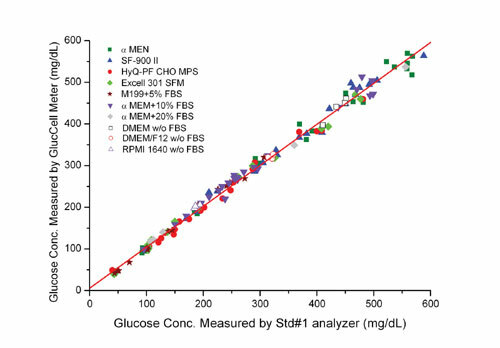 To prepare samples with different glucose concentration in commercial serum-free culture media, including SF-900 II (GIBCO, Invitrogen) and Excell 301 (SAFC Biosciences), as well as a protein-free medium like HyQ PF-CHO MPS (Hyclone), a known amount of glucose was added to the medium of which the concentration is lower than desired. Alternatively the medium was cultivated with cells for several days to reduce the concentration to a desired level. All glucose concentrations for reference were measured and determined. The devices used to measure the glucose concentration in this study consist of two common biochemical analyzers (referred to as Std 1 and 2 ), four commercial blood glucose meters, and one glucose detection kit with ELISA plate, and the newly developed GlucCell from Cesco. For the biochemical analyzers, blood glucose meters, and GlucCell glucose meter, the measurement was done according to specified instructions. For the glucose detection kit, 2 &#181L of glucose samples were loaded to ELISA plates and then a glucose oxidase reaction solution of 198 &#181L was added for 20 mins at 37&#176C. The absorption was measured by a spectrophotometer at 500 nm. Fig.2: Comparison of glucose concentration measurement by various blood glucose meters. CHO cells were cultivated in Cesco&#8217s BelloCell 500 bioreactor in HyQ PF CHO MPS serum-free culture medium. During the course of culture, GlucCell and Std 1 were used to measure the glucose concentration from which glucose uptake rates (GUR) were calculated. Various glucose concentrations prepared in aMEM basal medium were detected by several commercial systems, including Std 1 and 2, ELISA, and GlucCell glucose meter. 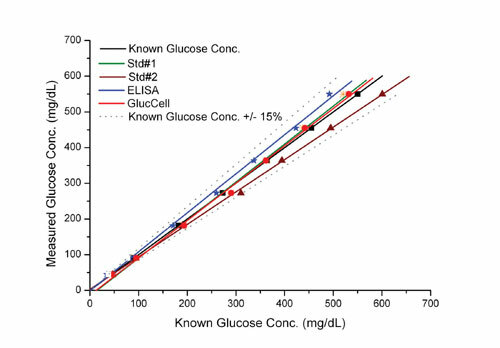 The results shown in Figure 1 illustrate that the accuracy of glucose measured by GlucCell was as good as that by Std 1 method and better than that by Std 2 and the ELISA enzymatic method. However, all results are within 15&#37 accuracy range, which is generally considered acceptable for glucose measurement in cell cultures. Figure 2 shows the comparison of the GlucCell measurement with other commercially available blood glucose meters. Results indicate that only GlucCell can be adopted for the glucose measurement in cell cultures, even though all of them were designed based on the same principle and methodology. This is primarily due to the difference of calibration procedures applied in different sample environment for its specific application. GlucCell was specifically calibrated and designed for cell culture application. Figures 3 and 4 show the effect of various commercial media and FBS concentrations on the GlucCell glucose measurement and the Std 1 method. Results show that there is no noticeable effect of medium and FBS on measurement of glucose concentration. 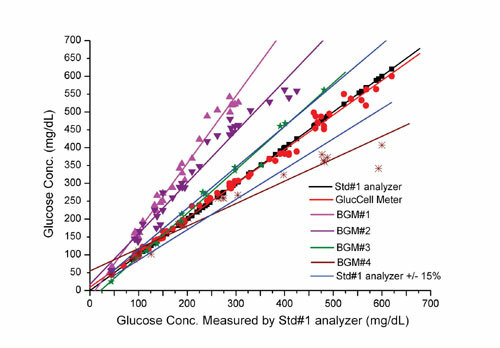 Results indicate that there is no apparent effect of the presence of CHO cells in the sample medium on the glucose measurement by both GlucCell meter and the Std 1 method. All these results confirm that GlucCell is as accurate as the Std 1 method. Consistency of GlucCell measurements were evaluated with triplicate assays on each concentration. The consistency was determined by a value of CV that was defined as (SD/average) x 100&#37. Results show that all CV&#37 values are below 4&#37. Accuracy was evaluated with triplicate assays on samples with various known glucose concentrations. The accuracy was determined by percent recovery, defined as (average/target) x 100&#37. Results are greater than 90&#37. Linearity was evaluated with assays on five series dilution of a sample medium with known glucose concentration of 564 mg/dL. GlucCell glucose meter was developed through modification of a commercial blood glucose meter that was designed specifically for glucose monitoring for diabetes patients. GlucCell meter has been shown to be as accurate as the two most commonly used biochemical analyzers for glucose measurement in cell cultures. In reference to Std 1 measurement, there was no noticeable effect of various culture media, FBS, or cells on the measurement by GlucCell. The consistency, accuracy, and linearity of measurement using GlucCell meter were also excellent. The cost of the device and consumable items, as well as the time, sample size, and labor required are favorable to the use of GlucCell over other commonly used devices. GlucCell meter provides a simple, accurate, and economical alternative for glucose measurement in cell cultures. 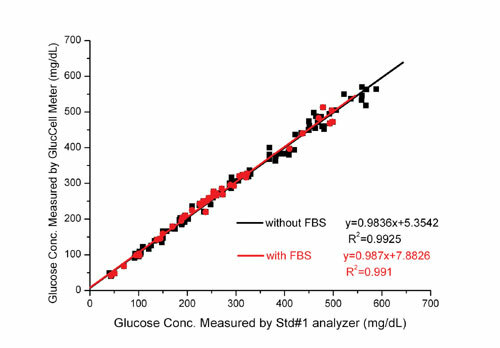 Fig.4: Effect of FBS on glucose measurement.